When You Feel Stuck, Take Off Your Shoes, Pull Them Out of The Cracks. Keep It Moving! God never said this life journey would be easy. He promises a life lived for him will be worth it. He says in his word he will never leave us or forsake us. His presence will always be with us. Thank God for the journey. It was meant for you. God promised to restore, elevate, and promote you. He will teach, discipline, refine and mold you into the person He designed you to be. In all things, God will get the glory. You will face challenges. Trials and tribulations are to be expected. It’s who you will choose to trust when going through it. God is all-knowing. He knows and understands all that you are going through. Trust him. He will do just what he said he will do. Praise God in the good and the bad. When you don’t understand what’s happening or it doesn’t make sense, STAND. Give it to God. 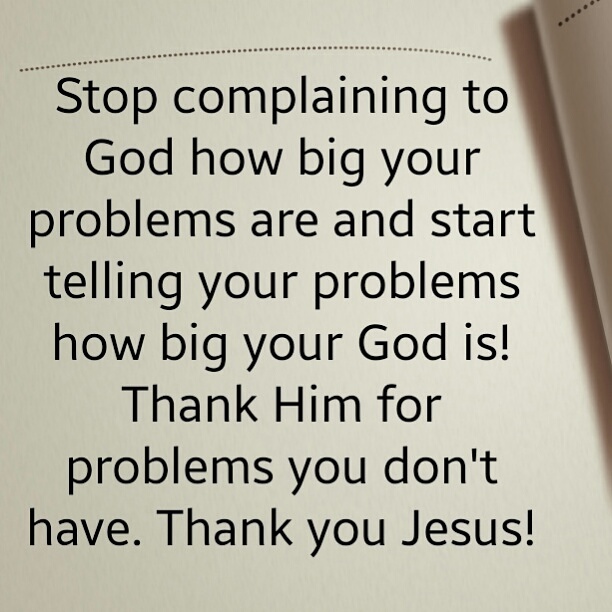 He is bigger than our problems. Great is our God. No manner of sickness, disease, obstacle or setback can separate us from the love of God. Be encouraged. Shoes are made for walking but when they are worn, the pain can be unbearable when you walk. Journeys are not meant to break us but to teach us a new way to walk. Like the heel of a shoe in the sidewalk, we may fall between the cracks along the way and get stuck. We either can take the shoe off, pull it out of the cracks and move on, or allow it to defeat us and choose to give up. Don’t be discouraged. Walk in your purpose. Keep it moving! It’s Time to Get Your Praise On. Stop What You’re Doing Right Now and Give Thanks to Jesus! 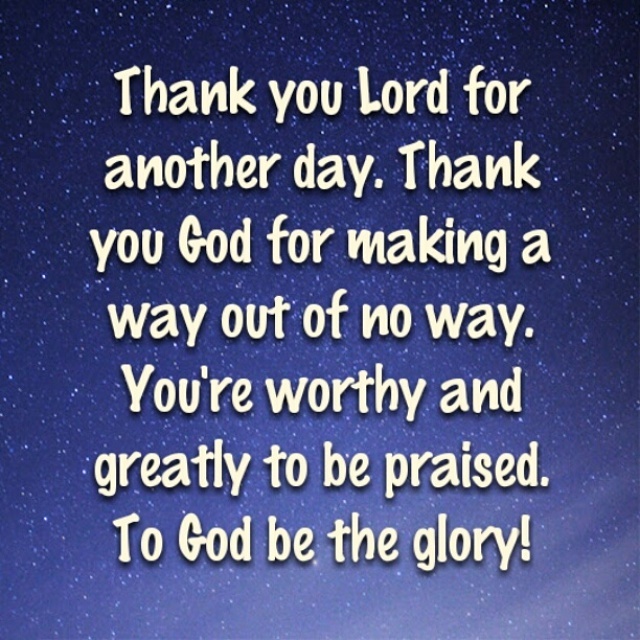 God is worthy and greatly to be praised. Don’t think about your situation. God granted brand new mercies. Thank God for a portion of your health and strength. Thank him for waking you up this morning. When it seems difficult to find words to say when going through fiery trials, God will calm the raging storms. Call the name Jesus, Jesus. The doctor operates but God will heal. The lawyer represents your case but God will settle it. The enemy comes to kill, steal, and destroy. God will deliver. You are more than a conqueror. Be grateful for what you have and don’t have. God is keeping you alive to fulfill a greater plan. Thank you Lord for saving grace. Thank you for all you’ve done. We won’t complain. You’re simply amazing. We love you Lord. Father thank you for waking us to see another day. Your grace and mercy kept us. Bless your name. Thank you for keeping watch over us through the night. Thank you for another chance to get it right. Jesus became poor for our sake that we may be rich. God is our Father. We’re unimaginably rich in Christ Jesus. “For you know the grace of our Lord Jesus Christ, that though he was rich, yet for your sake he became poor, so that you through his poverty might become rich” (2 Corinthians 8:9). God you’re so good to us. Get your praise on. Stop what you’re doing right now and give thanks to Jesus! Thank you Lord for another day. Thank you God for making a way out of no way. You’re worthy and greatly to be praised. To God be the glory! Comments Off on It’s Time to Get Your Praise On. Stop What You’re Doing Right Now and Give Thanks to Jesus! 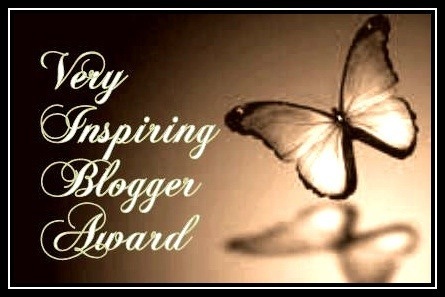 When I look back over my life and think of all God has done for me, I can’t help but to thank him and shout glory! My life is filled with the goodness of God. My heart is full. I have the peace of God. The more my mind and soul are at rest, the less I am distressed. I don’t worry about a thing. I know I’m blessed. Had my life been this simple years ago, I would have been on top of the world but then I thought, had I not met with trials, trouble, and tribulations, how would I have overcome? Had I not faced insurmountable obstacles causing me to seek God’s help, where then would my provision have come from? Certainly not me. I was a mess myself. I was so messed up and couldn’t get a thing right which caused me a lot of trouble. Every decision I made without God turned into a disaster. Had I not met with what I felt was a tragedy in the death of my former life when I lost everything, what would I have or where would I be now? Without God, I would have nothing. Every trial, test, tragedy, trouble, and tribulation was for God’s purpose. It strengthen my faith. It wasn’t meant to be finished sooner rather than later. God had a purpose. For every terrible experience, God intended to use it to accomplish a greater good. Everything I have gone through in my life was for a greater good. People may have left me, folks may have talked about me, and some may have even denied me. But God. I’m a living testimony. I’m still standing. I found that in every season of my life, even though it took years, God had to work through me, prune, and develop me for my future to arrive here. I’m stronger, wiser, better. I have no regrets. Had it not been for the Lord on my side, my soul would not be at rest. God I thank you. My soul cries yes! When in distress, take a moment to look over your life and think about the goodness of God. When you meet new trials, remember how great God is and how good He has been to you. Think about all the good things, even in the bad times, that God has done for you. There may have been some bad times and trouble seemed like it was going to last forever. God is a good God. He is always on time. He is sovereign. We don’t know what a person had to get through to get where they are. They don’t look like what they been through. God brought them this far. In everything, give thanks to God. It was by his grace you made it. 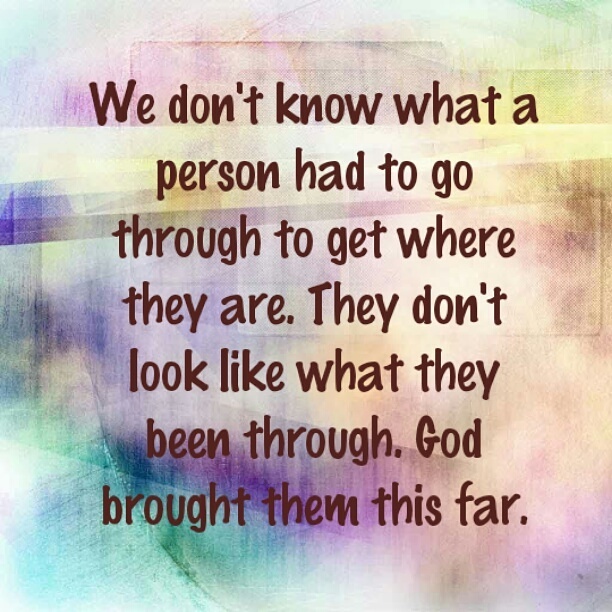 God brought you this far. Comments Off on I GOT A TESTIMONY! There’s someone somewhere fighting for, holding on to dear life. No matter how difficult it may seem, be thankful for your life. Good morning! Thank God for your life and all that you have. You may not have all that you want but you have what you need. Things may not be going well, but it could be worse. Give thanks to God, not for your problems but for strength he’s given you to get through every difficult experience. Be encouraged. Praise God. Your situation may not be the best of the best, but it’s not the worse. Take heart – “And we know that for those who love God all things work together for the good, for those who are called according to his purpose” (Romans 8:28). God is faithful. I’m Grateful for All I’ve Been Through. How About You? The other day I sat in admiration, thanking God for all I’ve been through. My life may not have been what I wanted it to be but I’m assured it was God’s grace that kept me and brought me through. As I began to reflect on the many years I have struggled and fought to maintain, I began to think about what I concluded as the reason God needed me to be in the seasons at the times I found myself in. If I were to look at my circumstances, I would always be in tears. I’m so glad I serve a mighty God. He gives me courage to face my fears. I can’t help but to give glory and honor to God. Praise the Lord! We all will go through a season in life that will bring insurmountable challenges we may never understand. Hold on to God’s unchanging hands. 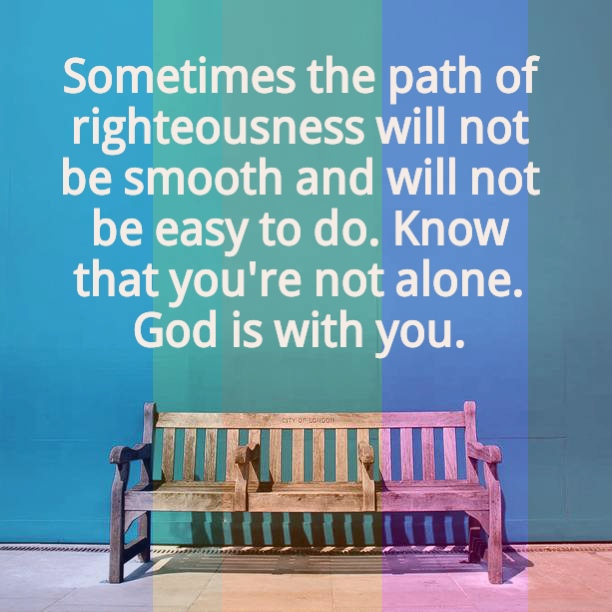 Sometimes the path of righteousness will not be smooth and will not be easy to do. Know that you are not alone. God is with you. If you sat and thought about everything that isn’t going right in your life and compared yourself to ones who seem like everything is perfect. It’s misleading. You’re not looking in the right place. Look to God outside your circumstances. His way is perfect. God sends trials to us to test our faith in him. Either we will choose to trust ourselves and do things our way or have faith and wait on him. Trials and tests are meant to challenge our faith. Challenges are meant to help us grow while we wait. For everything there’s a time and a season. It is for God’s purpose. Every person you meet and every experience you encounter occurs for a reason. He’s preparing you for your future. 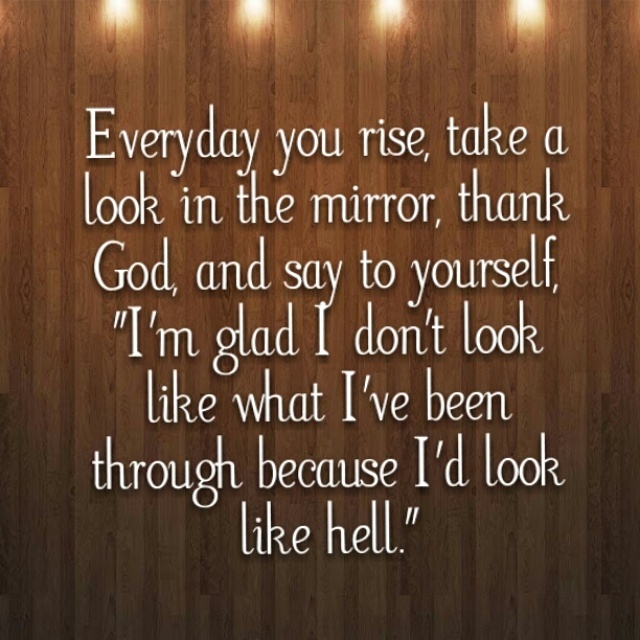 God is refining you. He is perfecting the spiritual gifts in you. God does everything according to his timing. You may think you have it all figured out according to your plan but it will work in his time. God does amazing things. Let your witness be about what Christ has done and not about your abilities and what you’ve done. Glorify his name. No matter the season you may be going through, wait on God. He’ll bring you through. Take a Look Around and Tell Me What Do You See? Take a look around and tell me what do you see? Do you know what life can be like for someone living in agony? But still thank God for the life they live? And they are appreciative? They are still able to maintain not because of what they see. But because even during their affliction, they still may bring God glory. Stop and take a moment and observe the place in life you’re in right now. Ask yourself, if anything, what am I thankful for anyhow? Do you see anything that may be amiss? Or do you feel uncomfortable, sad, or is it heavenly bliss? When I look around where I find myself now. I see people in a hurry, really going nowhere. I see homeless people that have nowhere to go because the home they once lived in is no longer there. I see people sick and in pain, lonely, have lost loved ones. I see people hurting because life to them is no longer fun. I see those that are lost, in search of answers, and can’t find their way. I see people struggling day to day. Just to make it through the day. There’s someone having a hard time living with a sickness or a condition where they cannot care for themselves, let alone live with someone else. Or have to live in a place where someone has to care for them. And basically have no control of their life but still they win because they are still living. Take a look around and tell me what do you see? Do you see a life that may not be what you want it to be? And find yourself in a precarious predicament. Only to feel you are spent. Since nothing’s going right according to you. But to God it is right where he needs you. Be thankful. Don’t take life for granted. Even if you are living a life you are not accustomed to, don’t let it take hold of you. Even if you don’t agree with what’s being required of you. Don’t complain about it. Or even be mad about it. Instead, praise God. Be glad about it. Because life happens and we don’t have any control over it. And although we can take charge of it, remember God is in total control of it. We may complain about things we don’t have or because life is not going our way. But remember, in the life of someone else it could be worse than we could ever feel on any given day. 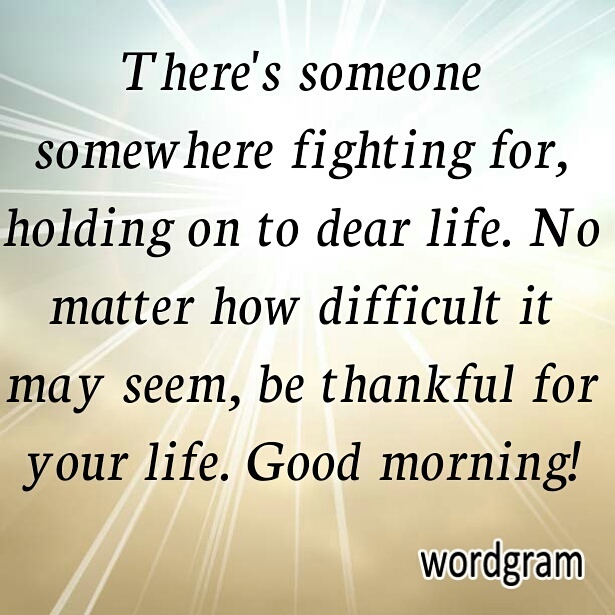 There is someone, somewhere, who right now is in the fight for their life. They are not living in paradise. As they struggle to stay alive. Needless to say, once we die. We are taken away from this earth permanently. We won’t ever again have an opportunity, to live life abundantly. One God gave us for free. We won’t ever wake again. To make the best of a life we once took for granted. Thank God wherever you are in the face of adversity. Take it all in stride with humility. Humble yourself. Know it is part of God’s plan. Everything we encounter has a purpose and is better than. What we can imagine. Don’t despair. It is a privilege to be there, where you are. Be thankful to God that he brought you to it. Make the best of it. Take a look around and tell me what do you see? Even though life may not be what you want it to be. Remember there are so many people that are much worse off than you or me. Count it all joy! Comments Off on Take a Look Around and Tell Me What Do You See?